Do you remember the Simon and Garfunkel tune, 59th St. Bridge Song–specifically the lyrics, Slow down you move too fast? Surely you do. A catchy tune. And the sentiment nice. We nod in agreement: Yes, we move too fast. Let’s slow down, smell the roses, or the coffee, whatever, savior the moment–nice little tag line to modern life. But, like the weather, everyone talks about it, and nobody does anything about it (often misattributed to Mark Twain). That is, we all agree, we should relax a bit, but we don’t. Which is why the weather over Iceland for the past two weeks has been philosophically interesting. Nothing can be done about it, but there’s a lot of talking going on. What if, Benjamin Button-like, the world were to go backward from this place? Planes stayed on the ground, television got fuzzy, then stopped altogether, Google, Facebook, Twitter all disappeared, followed by the internet. Down the drain. Silicon chips turn to dust. And so on. What if, like Thoreau at Walden, modern life were reduced in some fashion more, well, rudimentary? 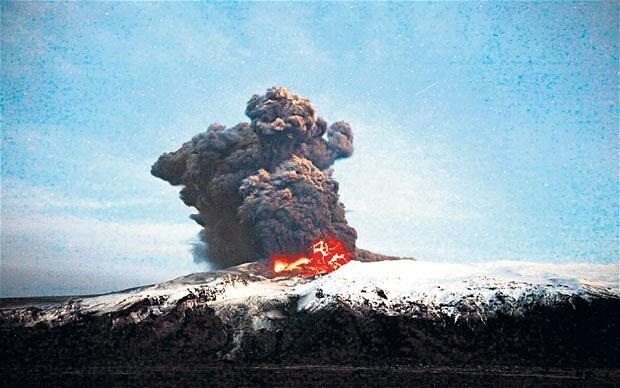 A spewing volcano in Iceland has put a stop to trans-Atlantic flights. I pity the poor folks who are just now getting airborne in Europe and will be turning around. And I pity too, the companies that have lost so much money, the farmers who couldn’t get their products shipped, the grandparents who missed the birthday party, and the specialist who could not get her patient to the clinic. Untold dollars, Euros, Pounds lost. Lives and plans disrupted. It is all so very unfortunate. But it proves an interesting template for the imagination. I sit in my over-stuffed chair and ponder the dogging question, the one about living more authentically. I was talking to my bookseller, Stuart, about this just yesterday. I had ordered a Simon Critchley book, the philosopher out of the UK. He asked what drew me to this book specifically. I answered in a round-about, half-baked fashion, that life as moderns is perhaps disjointed and that Critchley had worked on this some, that, as he–Critchley–said, philosophy arrises from disappointment. I wanted to learn more. Stewart got it, and just by talking about it a bit, I better understood what I was trying to get at. Which brings me back to the weather over Iceland. Specifically, traveler Seth Stevenson watered the germ of this idea for me yesterday in an op-ed piece in the Times. It’s called Escape From the Jet Age and is a meditation on the grounded planes in Europe. It included this sentence: “Airplanes are a means of ignoring the spaces in between your point of origin and your destination.” Precisely. Now take this idea and blow it up. Explode it. My point of origin: birth. My destination: death. And the big question: What spaces between origin/birth and destination/death am I (unwittingly) ignoring? You get the idea, I hope. Modern life is a sprint and when we cross the finish line, there is the possibility that we will have no idea the path taken. How do we mitigate that possibility, avoid committing that sin? That’s the heart of it, I think.